Malaysia - Do you see soup kambing or mutton chop? Do you see soup kambing or mutton chop?, originally uploaded by Camemberu. Ah Malaysia...where you can see your food before it becomes food. 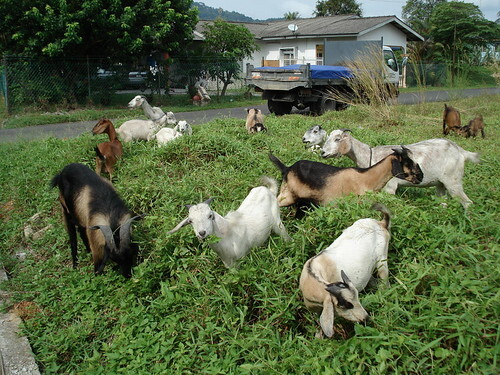 These goats are grazing in a residential area near the town centre. Yes, a surprise at first sight but I guess this little green kampung (village-like) enclave has been sheltered from the tar, concrete and steel development that's plagued the rest of the town. I love it! hi do u know where i can buy one goat ?